Just as President Obama announced that leaders in both chambers of Congress reached an agreement to resolve the debt crisis, House Speaker John Boehner participated in a conference call with GOP House members in which he played up Republicans' strong influence on the outcome of negotiations. When one conference call participant told Boehner that he'd "scored an eagle on the 18th hole and won the U.S. Open," the Speaker said that's exactly how he felt. He described the agreement as "all spending cuts." 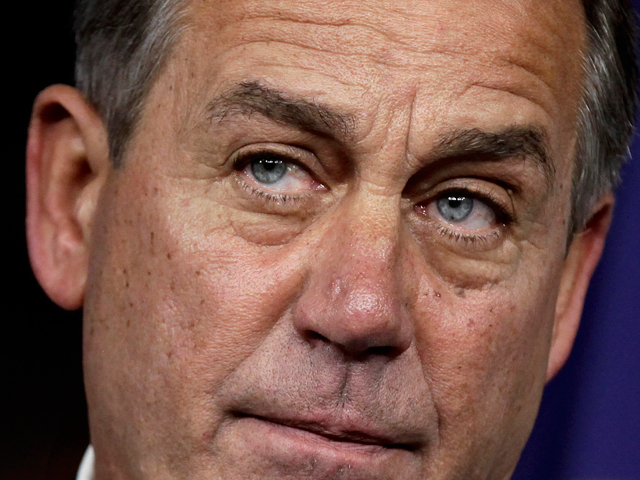 "There's no agreement until we've talked to you," Boehner said in the conference call. "There is a framework in place that would cut spending by a larger amount than we raise the debt limit, and cap future spending to limit the growth of government. It would do so without any job-killing tax hikes. And it would also guarantee the American people the vote they have been denied in both chambers on a balanced budget amendment, while creating, I think, some new incentives for past opponents of a BBA to support it." He discussed his handling of the negotiations and how the White House had to cave on several issues, stating, "Remember how this all started: the White House demanded a "clean" debt limit hike with no spending cuts and reforms attached. We stuck together, and frankly made them give up on that." "Then they shifted to demanding a "balanced" approach - equal parts spending cuts and tax hikes. With this framework, they've given up on that, too," he added. Boehner acknowledged that "this isn't the greatest deal in the world. But it shows how much we've changed the terms of the debate in this town. "There is nothing in this framework that violates our principles. It's all spending cuts. The White House bid to raise taxes has been shut down. And as I vowed back in May - when everyone thought I was crazy for saying it - every dollar of debt limit increase will be matched by more than a dollar of spending cuts. And in doing this, we've stopping a job-killing national default that none of us wanted." When one conference call participant told Boehner he deserves a Gatorade and a cigarette, Boehner replied: "How about a Merlot and a cigarette?" Below is the presentation to GOP House members. See Speaker Boehner's presentation here (PDF). (3) advances the cause of a Balanced Budget Amendment Framework accomplishes this without tax hikes, which would destroy jobs, while preventing a job-killing national default. Same as House-passed bill, the framework includes no tax hikes. Same as House-passed bill, framework includes spending cuts that exceed the amount of the increased debt authority granted to POTUS. Would cut & cap discretionary spending immediately, saving $917B over 10 years (certi?ed by CBO) & raise the debt ceiling by less - $900B - to approximately February. Before debt ceiling can be raised, Congress and the president must enact spending cuts of a larger amount ?rst. As in House-passed bill, framework imposes spending caps that would set clear limits on future spending & serve as barrier against gov't expansion while economy grows. Same as House-passed bill, framework requires both House & Senate to vote on a BBA after Oct. 1, 2011 but before the end of year. A Balanced Budget Amendment is sent to the states. Same as House-passed bill, framework creates a 12-member Joint Committee required to report legislation by November 23, 2011 that would produce a proposal to reduce the de?cit by at least $1.5T over 10 years. Each chamber would consider Joint Committee proposal on an up-or-down basis without any amendments by December 23, 2011. If Joint Committee's proposal is enacted OR if a Balanced Budget Amendment is sent to the states, POTUS would be authorized to request a debt limit increase of $1.5T. Sets up a new sequestration process to cut spending across-the-board - and ensure that any debt limit increase is met with greater spending cuts - IF Joint Committee fails to achieve at least $1.2T in de?cit reduction. If this happens, POTUS may request up to $1.2T for a debt limit increase, and if granted, then across the-board spending cuts would result that would equal the difference between $1.2T and the de?cit reduction enacted as a result of Joint Committee. Total reductions would be equally split between defense and non-defense programs. Across-the board cuts would also apply to Medicare. Other programs, including Social Security, Medicaid, veterans, and civil & military pay, would be exempt. Sequestration process is designed to guarantee that Congress acts on the Joint Committee's legislation to cut spending.